Columbia Masterworks label released records from 1927 to 1980. After that, it was separated from the Columbia label and renamed CBS Masterworks. Please note that starting around 1958 possibly into the early 1970s, LPs on this label list two catalog numbers on the sleeve: an ML number (for the mono recording) and an MS number (for the stereo recording). Check the physical record to determine the version of your copy. 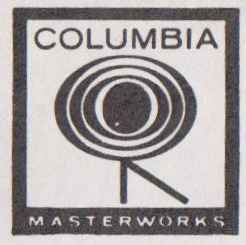 Columbia Masterworks was renamed CBS Masterworks Records in 1980 and removed from the Columbia label. In 1990 it was again renamed Sony Classical Records because of the sale of CBS Records to the Sony Corporation. The Masterworks brand is currently used on Masterworks Broadway Records as well as Sony Masterworks, Sony being the parent label for both. 78 RPM album sets may have multiple catalog numbers on various parts of the release. As always, please try to enter all of the variations, along with release notes explaining what number appears where. Records with "AM" or "MM" numbering were configured for different types of record changers. AM has the sides in sequence across the front of each record (e.g. A = side 1, C = side 2, E = side 3), then continuing with the back of each record from the first to the last (e.g. B = side #4, D = side #5, F = side #6). MM has the continuation from the last to the first (e.g. F = side 4, D = side 5, B = side 6).